The drawing room at the Savile Club: gilded and wood-panelled, faded-grand, the carpet soft as whispers. It's time for the judging panel. 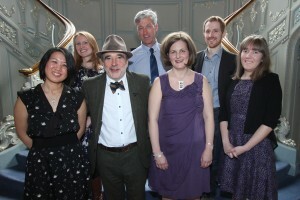 Barry Cunningham and the shortlistees at the 2015 Times Fiction Competition judging day. Our seven judges arrive - best-selling author Sophie Mackenzie; Alex O'Connell of The Times; Melissa Cox from Waterstones; Kate Newport from Scholastic Clubs and Fairs; Natasha Farrant, literary scout and author; Tereze Brikmane from the indie children's bookshop Tales on Moon Lane; and our very own Barry Cunningham. Before long, we're sat at a round table (in true Arthurian diplomatic style!). Over tea, coffee and custard creams, the discussion commences. I'm an impartial note-taking observer, and (although it's occasionally an effort to stop myself interjecting!) it's very informative to watch. I can't help but feel proud and a little protective of our final shortlisted six novels that have come so far, each of which receives praise and criticism from the panel. The discussion is lively, and each judge initially has a different favourite, which seems to come as a surprise to some of them. By quarter past twelve, however, the decision is unanimous. For the first time, we've invited the shortlisted authors to lunch for the announcement of the winner - and this year's shortlistees are an enthusiastic and dedicated group of writers. Despite the fear-factors of a photographer/videographer and two PRs, the authors keep their cool through the pre-lunch mingle. We sit down - in a judge-beside-shortlistee arrangement - and tuck in. Over rice pudding, Barry and Alex announce the winner: Laurel Remington! It's touching to watch the transformation of her expression - surprise, joy, and an overwhelming sense of relief. And despite inevitable disappointment for the runners-up, everyone is genuinely pleased for her. Post-lunch, the shortlistees exchange email addresses (word is there's to be a writing group!) before heading off to the nearest pub for a well-deserved pint. Gradually, the drawing room empties, and it feels like the end of something special. But of course, it's only the beginning. We can't wait to start on preparing Laurel's excellent novel for publication - and, meanwhile, we'll continue to work with the entire shortlist, offering editorial notes and guidance, and readers' reports for everyone on the longlist. Laurel described her road to publication as 'a long haul', spanning several books and several years. She's a wonderful example: keep trying ... and enter the 2016 Times/Chicken House Children's Fiction Competition!